There are several different styles of kitchen and bathroom countertops. In this article, I will explain how the most popular countertops are made. The list will include Formica, Granite, Glass, Solid Surface and Concrete. You are going to need to watch the videos that demonstrate how to install undermount sinks with Formica counters. HD Wilsonart plastic laminate integral sinks have three methods of installation. How you install the under-mount sink will depend upon the countertop style you are working with. Have you ever wondered where all those beautiful pieces of granite come from? How do the slabs get processed to look stunning on kitchen and bathroom counertops? Well, I found an excellent video that tells how granite is extracted and processed into shiny slabs. Granite is one of the strongest stones on earth. It’s the darling of decor these days. As an indoor/outdoor building material, it’s timeless and resistant to acid rain. Natures granite factory lies many miles below the earth’s surface. Boiling molten rock, called magma, builds up pressure from the intense heat and rises through cracks and crevices in the earth’s crust. As it rises, it slowly cools and solidifies into granite. Now you can get an integral look with your kitchen sink using plastic laminate countertops. Wilsonart offers a series of integrated sinks in various styles and different sizes. They are available in solid colors of pure white or ivory. Some are designed for kitchen areas and others will work with bathroom vanity laminate countertops. Beveled edge plastic laminate countertops are made the same way as square edge tops, except, special molding is applied to the front edge to create the decorative look. 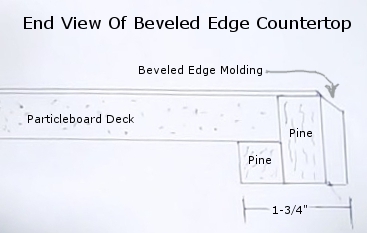 We will be looking at how to make a Formica counter and then apply the beveled edge molding pieces. I will also share where you can get this molding that glues to the front edge of the tops.